Scottie Lindsey shoots a three-pointer. The senior forward and the Wildcats will have to navigate a schedule that includes two conference games in early December. In the final game before Fall Quarter exams last season, Northwestern cruised past DePaul in the middle of its nonconference schedule. This year, senior guard Bryant McIntosh and company will be taking on Big Ten competition for their exam tune-up. A drastically restructured conference schedule will bring Illinois to Allstate Arena on Dec. 1 for the respective rivals’ conference openers, then send the Wildcats to Purdue for another high-stakes battle two days later. The pair of Big Ten games splits NU’s nonconference slate — the usual 13 games — into two segments of seven and six games, respectively, and falls directly after the team’s visit to Georgia Tech on Nov. 28 as part of the annual ACC-Big Ten Challenge. 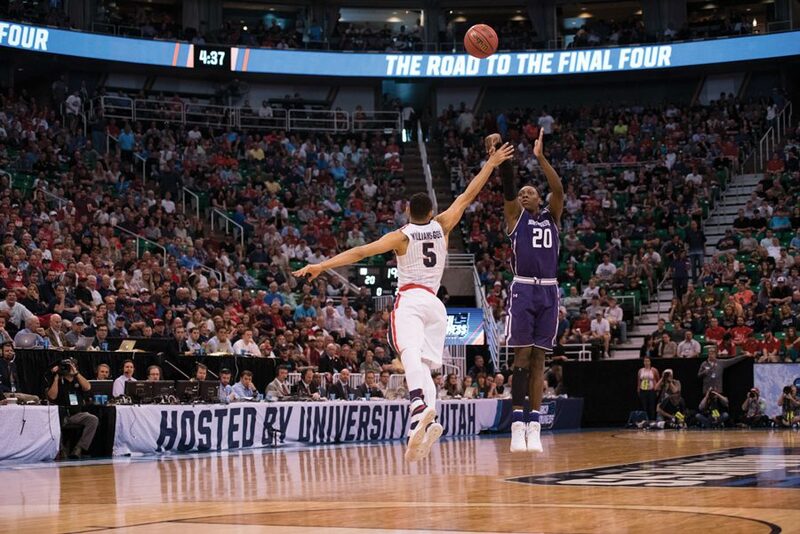 The unprecedented scheduling quirk will force coach Chris Collins’ squad to find its A-game particularly early this year, the coach noted in a news conference last month. The Cats, despite their groundbreaking overall success, did not record a single win in four tries last season against the Fighting Illini and Boilermakers. In 121 meetings since 1949, Illinois and NU have never played earlier than Dec. 29 in any given season and have met prior to New Year’s Day only twice. The early taste of conference competition won’t be the only notable challenge, either, in a November and December schedule that is significantly harder than in past years. Following two season-opening cupcake games against Loyola (Maryland) and St. Peter’s, the Cats will enter a taxing week that begins with Creighton — a No. 6 seed in last March’s NCAA Tournament — and finishes with the Hall of Fame Tip Off Tournament, pitting NU against La Salle and either Texas Tech or Boston College. The Cats will also play two true road games against fellow major-conference competition: the aforementioned trip to Georgia Tech in addition to a visit to Oklahoma, a Big 12 team expected to take a major step forward this year, on Dec. 22. Once NU gets into the thick of Big Ten competition, which resumes Jan. 2 when Nebraska comes to Rosemont, it’ll find rest periods few and far between. To allow the Big Ten Tournament to be held at Madison Square Garden this season, the conference moved the tournament a week earlier than previous years and thus condensed the regular season schedule leading up to it. The Cats will finish their 2017 slate with a four-games-in-eight-days gauntlet that includes matchups against both 2017 Big Ten runner-up Wisconsin and 2018 favorite Michigan State. With that race to the finish still months away, however, Collins said he’s focused on the season’s earliest challenges first.